← How to convert MS Office PowerPoint documents of PPT to AVS? There are two ways to convert WMF to PDF and edit PDF keywords. The first method requires Adobe Acrobat. The second one does not. 1.1. To convert WMF to PDF, you should download an image to PDF converter from the internet and use it to convert WMF to PDF. For example, VeryPDF image2pdf can help you convert images like WMF to PDF. You can download this converter by clicking image2pdf. 1.2. After you convert WMF to PDF, you can edit PDF keywords as follows: right click the icon of the new PDF file, > click Properties to open the Properties dialog box, > click the PDF tab, > type keywords in the Keywords edit box, > and click OK. This method requires a command line application such as VeryPDF HTML Converter Command Line, which can be downloaded by clicking here. After you install it on your PC, you need to take two steps to solve your problem. 2.1. You should first open the command prompt window: click Start, > click Run to open the Run dialog box, > type cmd, > click OK.
d:\htmltools\htmltools.exe is the directory of the executable file of VeryPDF HTML Converter Command Line. -keywords "USA" is the option that can be used to edit PDF keywords. USA is set to be the PDF keyword. c:\in.wmf represents the input file. You can change the directories in the example. 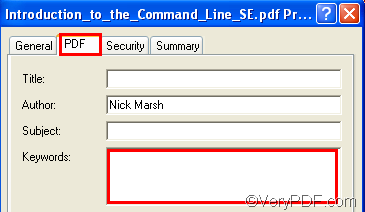 After you press Enter, you can view the information of conversion from WMF to PDF in the command prompt window. The appearance of “result=OK” in the command prompt window tells that the conversion is finished. If you want to buy VeryPDF HTML Converter Command Line, please click Purchase. This entry was posted in HTML Converter (htmltools) and tagged command line, edit pdf keywords, wmf to pdf. Bookmark the permalink.